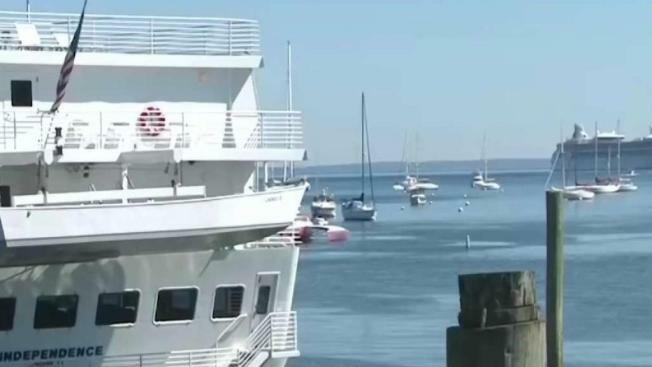 A non-profit in Maine is floating the idea of re-purposing an old cruise ship to make a shelter on the water. In a heated debate over where to put Portland, Maine's new homeless shelter, a non-profit is floating the idea of re-purposing an old cruise ship to make a shelter on the water. Ken Capron, the founder of non-profit Memory Works, is applying for a grant to fund a feasibility study. "It's a creative idea," he said. "This is a solution to so many problems." Capron thinks Portland can find an old 400-cabin cruise ship for under $20 million. He thinks the ship could house social services and even have room for immigrant and low-income housing. "We would give them all the resources they need to succeed, and we would put it right there on the ship," Capron said. The ship would be permanently docked on the Portland waterfront. No other cities in the world have tried the cruise ship shelter idea, but some cities, like San Francisco, have considered it. Portland's homeless population has been growing and city resources are stretched thin. The city had been considering a proposal to create a 24-hour homeless shelter near the Portland-Westbrook city line, arguing that social services were too concentrated in the Bayside neighborhood. People living near the proposed site have come out strongly against the relocation of the shelter there, saying Portland was just moving a problem instead of fixing it. At the same time, Portland is dealing with a serious housing shortage. Portland Mayor Ethan Strimling says the Portland Housing Authority has a waiting list more than 1,000 families long and says they need creative ideas to address the crisis. He's not fully on board with the cruise ship concept but wants to hear more. "I have no idea if it's the craziest idea I've ever heard or the most brilliant idea I've ever heard," said Strimling said. Capron will discuss his proposal with stakeholders at a public meeting at Portland City Hall Tuesday at 1 p.m.